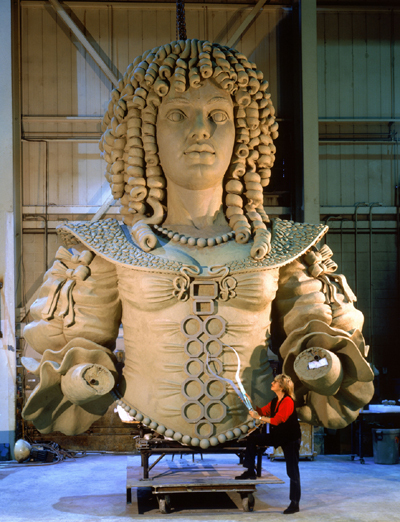 Audrey Flack, now 86, had nearly finished working on a gigantic bronze statue of Queen Catherine for public display in Queens, New York. But protesters blocked the project, associating Catherine with the British slave trade. Sadly, the sculpture was ultimately stopped and the bronze casting melted down. “I was crushed — it really just killed me,” said Ms. Flack, who said she had devoted nearly a decade of work to the statue, the most of any piece in her career. Ms. Flack said she had visualized a prominent memorial to a strong woman in a city with very few female statues. At times it seems more important for people to whitewash national heritage by removing figures of controversy than confronting them through art and discussion. Marc Anthony was right "The evil that men do lives after them; the good is oft interred with their bones." We opt to forget what was done that was good to revile that which was not. Doesn't leave much room for heroes in the future - everyone has feet of clay and is a product of their own time. The anger towards this project was possibly misplaced, and the result indeed seems tragic; the statue looks like it would've been beautiful. It is entirely possible that activists targeted the wrong thing for the right reasons, and it's important to have discussions to prevent that kind of thing from happening. However, I couldn't seem to find any real opinions or thoughts in this NY Times article from people of color. I'm not comfortable coming to conclusions after hearing from only one 'side'. I think it should be made clear that this case took place in 1998 and should not be conflated with current monument discussions..
Also, on the wikipedia page for this queen, the case for not installing the statue makes a bit more sense.. One motivator for the commission in the first place was to celebrate "Queens County," which had supposedly been named for this Queen, but historians believe there is no evidence of this being true. Some of the slavery-related objections seem misplaced, but I can see how the very-diverse borough of Queens would find a long-dead Portuguese queen an odd choice for commemoration, especially one that appears to have nothing to do with Queens in the first place. It's a shame a more suitable subject wasn't chosen- the statue looks really incredible, especially when compared to lots of other contemporary public art.. Commissioning art for diverse communities will always be fought with challenges and I think this is part of why there is so much abstract public work out there unfortunately. Nondescript blobs and cubes offend no-one except lovers representational art! To me there is no regret. If that is the story we can make everyone in this world a hero. Think of all the people who today are making Hitler a hero! There should be others from that time who deserved the monument better. That being said, if you look at any figure in the past there are TONS of horrible things that were done that were completely accepted in that time and was common. It was rare to be against slavery. For example, last year students at Princeton University tried to have Woodrow Wilson's name removed from a building because he was a segregationist (https://www.npr.org/sections/thetwo-way/2016/04/04/472985937/princeton-will-keep-woodrow-wilsons-name-on-school-buildings#). But he was the only US president with a PHD (personally, I think every president should have one) and kept us out of WW1 as long as possible, among other achievements. Yet he is judged against our current morals. I saw photos of him in a fur coat in 1911. Should we attack his legacy for being cruel to animals? It was trendy at the time and while we see it as wrong now it was seen as a form of upper society (as if we don't do the same with smart phones, tablets, computers, cars etc which are also harmful to the environment like the fur trade). I understand why the Confederate statues are being pulled down but if we keep at this trend... who is left to commemorate? Who is worthy of not being demonized for doing what most people did in their time? It seems to me all these questions of statues could be very easily solved, by embracing Americanism and having a vote of the people in a town or area. If they vote yeh! it stays or is approved, period. Any vandalism or damage to said statues should be viewed as an act or treason against the american way, met by removal of citizenship. When German immigrants came to America many statues of King Frederick the Great were erected in German communities. Germans caught hell and violence for it too. Some were even murdered over it, especially around WWI time. Most statues of Frederick have been removed these days, and few Germans could tell you who he was if ever asked. Trump is from Queens maybe she can get him to give her a piece of land there to build it. It seems unfortunate that the statue had to have a back story ( probably needed it for funding) at all. It would have been nice to just title it "Pretty lady in a pretty dress", and let the viewer make up their own story. I don't care for those little cards beside the paintings in museums that tell you what the artist was thinking either. People dont' want to pull down statues of Lee or now Theodore Roosevelt, or not allow statues like this because they were bad people, they want to destroy them because they were good people. When you can't create, you destroy and statues like this are reminders that the civilization that the globalists/radical egalitarians are trying to condemn was far better than anything they can offer. Also keep in mind the modernists think this is 'stepping backwards' I know there are many truly talented abstract artists but the majority lack the technical skill to even comprehend something like this. I also think art critics like art that is more abstract so they can control the meaning. Thanks, everybody. These are all thoughtful insights that add so much to the understanding of the story. Pen Name and Garrett, I agree that abstract art is so often used in public settings because it lacks these layers of associations. Motel art is usually abstract because it doesn't say anything and therefore doesn't offend anyone. Sheridan, you got it. The success of the Little Mermaid statue in Copenhagen partly comes from her being associated with a beloved story, rather than being tied to specific human in the historical past. History is continually being revised and reinvented. Bernicky and Michael, you make great points too. My sense of it is that if we're going to put up statues of historical figures, we should not expect any subject to be a paragon of virtue. No one can ever meet that standard. Everyone is a blend of darkness and light. I don't mind looking at statues of scoundrels (assuming they're not the scoundrels currently in power). Just as a main character in a movie is often a horrible person, a good statue can help us reflect on the darkness of someone's nature. For example, I spent a lot of time looking at a bust of Savonarola in the Victoria and Albert Museum, and in Russia there are statues of Ivan the Terrible that can be springboards to discussion. Mr. Gurney & Bernicky and Michael: Doesn't it pay to keep history in the present so we don't forget it? So that we examine ourselves and propagate the right and hopefully avoid repetitions of wrong? And knowing people were products of their times may help us recognize our own susceptibility and prevent an error we hadn't been aware was in the wings. Also, when our assessments are honest, it's an exercise in even-handedness and a good example for others. Sadly the story is triumph of ignorance and bigotry. Catherine had no connections to slavery - there was no slave trade in Tudor England. It's also unexplained why these types of people try to infer that Europeans invented Slavery in Africa in the 17th Century, when in fact Slavery was a huge institution in Africa for thousands of years. I don't see any calls to remove his statue.. though, I understand it's been vandalized in South Africa.